Dashboard version of Hardware Monitor. Is there a better alternative to Hardware Monitor Widget? Is Hardware Monitor Widget really the best app in Illustration category? Will Hardware Monitor Widget work good on macOS 10.13.4? Hardware Monitor Widget is the Dashboard version of its "bigger brother" Hardware Monitor. 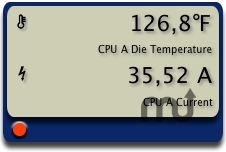 You need a working registered copy of Hardware Monitor in order to fully use this widget. The applications are designed to give you access to all sensor readings Mac OS X uses to monitor and cool your computer. Enhanced support for certain third-party batteries on mobile computers. Hardware Monitor Widget needs a review. Be the first to review this app and get the discussion started!